A city is hit by an epidemic of “white blindness” that spares no one. Authorities confine the blind to an empty mental hospital, but there the criminal element holds everyone captive, stealing food rations and assaulting women. There is one eyewitness to this nightmare who guides seven strangers—among them a boy with no mother, a girl with dark glasses, a dog of tears—through the barren streets, and the procession becomes as uncanny as the surroundings are harrowing. 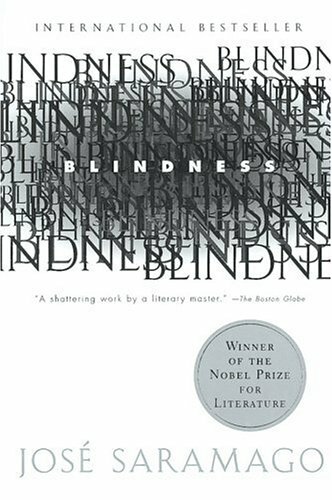 A magnificent parable of loss and disorientation and a vivid evocation of the horrors of the twentieth century, Blindness has swept the reading public with its powerful portrayal of man’s worst appetites and weaknesses-and man’s ultimately exhilarating spirit. Saramago’s Blindness is not a novel you read when you want a little injection of happiness in your life. It’s not a novel you read when you’re searching for the companion to your sadness. Blindness is a novel you read when you want to contemplate the origin of sin and the components of humanity. This is a terrifying descent into hell and back, not unlike Dante’s masterpiece The Divine Comedy . Who are people when they are no longer held accountable? Originally published in 1995 and made into a film in 2008, the novel follows the citizens of the world as they are struck by an epidemic of blindness. The novel centers primarily on the experiences of an eye doctor and his wife as they try to navigate this new world. In an effort to keep the epidemic from spreading, the initial sufferers of the plague of blindness are quarantined in an old mental hospital. From there, the treatment of the blind and their conditions of living fall deplorably. Saramago’s real stroke of mastery is providing the reader with one character who has not been struck blind amongst all the others- the doctor’s wife. Thus, we are given an eye-witness in the world of the blind. The metaphorical use of eyes, sight, and vision is appropriately rampant throughout the novel. Told with penetrating detail, Saramago uses the doctor’s wife to provide an entry into this horrific situation. He pays close attention to the level of filth and disorder that gradually coats the world, so much so that it feels oppressive even to the reader. The doctor’s wife lives in constant fear that she may lose her eyesight like everyone else. Though she fears this development, she also longs for it in that she would not have to see the depravity to which the world has fallen. When I initially began reading this novel, I was warned that it would be difficult to get through. Not in the sense that the writing isn’t engaging or the plot slow (both quite untrue). Blindness is difficult to get through because Saramago is ruthless in his description of peoples’ behavior towards one another, taking their cruelty and barbarity to a visceral level. Even with the forewarning, I indeed contemplated setting down the book because I was unsure if I could continue reading. That said, the difficulty in reading the novel is also its strong point. It takes great skill in a writer and storyteller to unsettle the reader to such a degree that they will consider putting the book aside for no other reason than unease. Searching reddit.com I noticed your website book-marked as: Blindness isleofbooks. Now I am assuming you bookmarked it yourself and wanted to ask if social book-marking gets you a lot of targeted visitors? I’ve been considering doing some social bookmarking for a few of my sites but wasn’t certain if it would yield any positive results. Thank you. It does sometimes. With the tags it helps me see how people are getting to my site. But not always. A lot of people seem to end up here for reasons unknown. I think tags help your blog rank higher in SEO results. Greetings from Florida! I’m bored at work so I decided to browse your site on my iphone during lunch break. I really like the knowledge you present here and can’t wait to take a look when I get home. I’m surprised at how quick your blog loaded on my cell phone .. I’m not even using WIFI, just 3G .. Anyhow, excellent site!